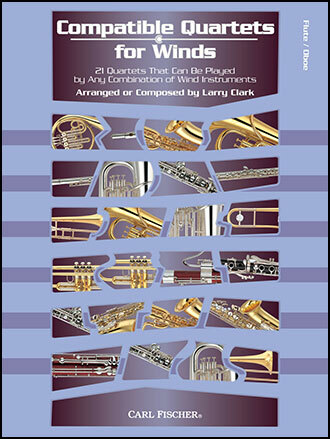 This collection contains 21 quartets in a variety of styles from classical to folk and includes original pieces that will be fun to play with any combination of four wind instruments. Quartets are a great way to learn how to play in a chamber-music setting, and this unique collection gives you the opportunity to do it with anyone else that plays a wind instrument - making the combinations of instruments that can be used almost limitless. The flexibility of these quartets makes them a must-have for any wind player. Titles include: Adagio from Concerto for Clarinet and Orchestra in A Major, K. 622 (Mozart); Amazing Grace (Traditional); The Entertainer (Joplin); German Dance (Haydn) and many more!